With the continuation of the construction of the Ilisu Dam and Hydroelectric Power Plant on the Tigris River in December 2014, the dam construction site has been militarized intensely. Check out more here! In the late 1970s, the Turkish Government launched the Southeastern Anatolian Project (GAP project), with the declared aim to produce cheap energy and to encourage land redistribution by increasing the amount of irrigable land. However, very high costs, project delays, negative environmental impacts of dams, and the failed construction of many of the irrigation works, turned GAP into a really difficult problem to solve over the years. The Ilisu Dam Project is the third biggest hydroelectric project of the GAP, with 1,200 MW of capacity installed; its reservoir will submerge approximately 300 km2 in the Tigris Valley. Even though project works started in 1954 the project has only been approved in late 1990s. Since then, several consortia of European companies embarked on the project, but they didn't received the support of national Export Credit Agencies (ECAs) because of controversial social, environmental and cultural impacts that it would cause; many of these companies therefore withdrew from the project. Since the beginning, civil society had complained about serious impacts of the construction of the dam, organized protests, demonstrations and launched campaigns in Turkey and in Europe, which have played a key role in rising awareness among institutions and citizens. Among them, the notorious campaign “Initiative to Keep Hasankeyf Alive” (ITKHA) was started in 2006 and organized a protest camp in October 2010. Hasankeyf is a 12.000 years old town condemned to disappear under the waters of the artificial lake of the Ilisu dam. Although there has not been reached a final agreement between the various actors involved in the project, displacement and resettlement measures have already been implemented. In 2010, the Turkish President expressed the willingness of continuing the project with national public and private banks even without foreign financial support. 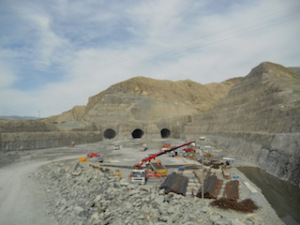 The works resumed only in 2011, and the project is still under construction with national and European companies funds. The ITKHA and the Chamber of Landscape Architects of Turkey tried to stop the project by calling upon the administrative court of Diyarbakır. In January 2013, the court sentenced to stop the project due to the inability to properly conduct the environmental impact assessments. The Turkish government changed the law in order to ignore the decision and pursue the project. In September 2014 Austria, Germany and Switzerland withdrew support for export-loan guarantees to building contractors for the project because developers were unable to meet the environmental and cultural conditions set by the World Bank. Nevertheless the construction of the dam is ongoing under a violent and unsecure environment. In the early year 2015, the PKK guerilla (the workers’ party of Kurdistan) destroyed machines and a pipe from the construction site. The governmental response was an increase of the militarization of the site, adding 600 soldiers to the 1.000 soldiers already located at the site. What’s more the intensified opposition to the project by the local population forced the companies to hire non-local workers. 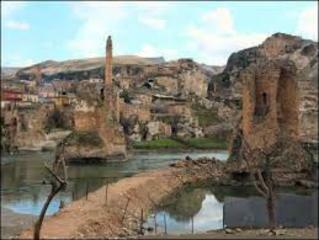 On October 20th, 2015 a Global Hasankeyf Action Day against the Ilisu Dam was held and a new campaign aims to declare Hasankeyf a UNESCO world heritage site, together with the Iraqi marshes. Yet the construction of the dam is about to be completed. Civil society and activists worries are very high regarding the threats on peace such dam is going to represent. Once effective, the dam will be forcing thousands of Kurdistan villagers to move to the cities while there is a high risk it will provoke water shortages for irrigation in the Iraqi valleys. Project Details The Ilisu Dam will be 138 meters high and 1,820 meters wide. It will provide a 1,200 MW power station with an annual generation of 3,800 GWh, which would represent about 2 percent of national electricity needs. This will be the second largest dam in Turkey in terms of dam volume (45 million m3) and 4th in terms of installed capacity. Development of Alternatives Local communities and ejos don't want the implementation of the project, as it only responds to companies and states interest. Middle Eastern Technical University Construction Engineering Department developed an alternative project consisting of 5 small scale dams instead of a gigantic Ilisu Dam. The developers of this alternative project presented their proposal to the relevant ministries but did not get a positive response. Anyways, the Turkish Superior Administrative Court ruled on January 7, 2013 in favour of the legal case filed by the Chamber of Architects and Engineers (TMMOB) against the construction of the Ilisu dam project, ordering an immediate halt to the controversial dam construction in southeast Turkey. 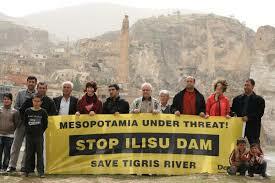 Court Case regarding Ilisu Dam in Hasankeyf on the Tigris Valley. Maggie Ronayne, The Cultural and Environmental Impact of Large Dams in Southeast Turkey, Fact-Finding Mission Report, National University of Ireland, Galway and Kurdish Human Rights Project, ubat, 2005, p. 13. Now the construction is “secured” by at least 600 soldiers more to the existing 1000 soldiers. These soldiers were already present in the military station and the six military points around the dam site. Also local militias are part of these increased measures. In the last months, more than 100 civil people in the four villages in and around the dam site were recruited by the state as militias. This makes more people dependent on the ongoing non-solved political conflict in the region. Several dozen workers, who stay 13 km away from the city of Dargecit (Kerboran), are accompanied by tanks when they drive daily to the dam site. On the 3rd of February the HPG attacked a convoy of construction machines which were on their way to the dam site. One of them was damaged and three people were injured slightly. In the city of Dargecit several dozens of cars were burnt down and many have been damaged. It is still not known whether these attacks were connected to the Ilisu Dam. These attacks rose tension among people.